« The Cruise … part two. Sunday August 24th. 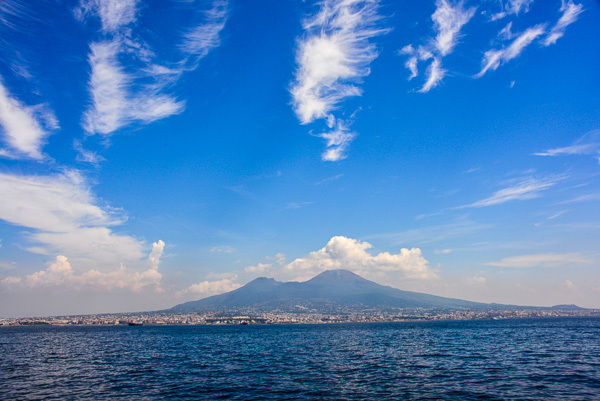 We arrive in Naples on a beautiful summer day with perfect fluffy clouds scattered across the blue blue sky. 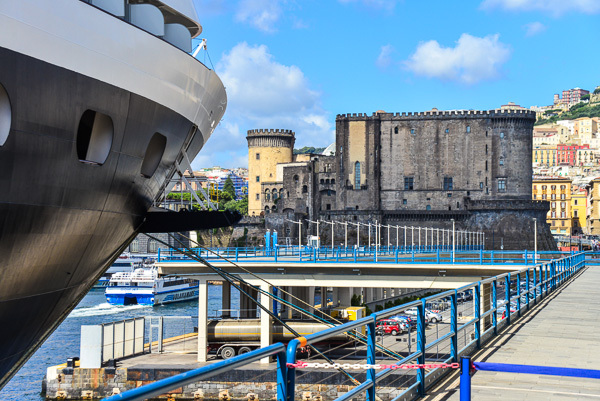 After our, by now usual, morning routine on the ship, breakfast is soon done and we set off into the city of Naples. First thing on our agenda is to find the hotel we are booked into and to work out whether a taxi will be needed for our cases. After a short walk we find the hotel in a narrow side street. A large glass door gives entrance to a marble hallway. A small notice on one side tells us that the hotel Napolit’amo is on the third floor. Doesn’t really look much like a hotel. This now disused church was right outside our hotel window. We won’t check in until this afternoon and so it is time to wander back to the ship, have our last meal aboard the MS Noordam and pack our cases ready for our imminent departure. Standing on the quayside with our cases we feel the pull of attachment. Attachment to the comfort of a bed that we know, meals on call at anytime and a general feeling of being cosseted. We have left our womb temperature nest for the rigours of life on the streets. 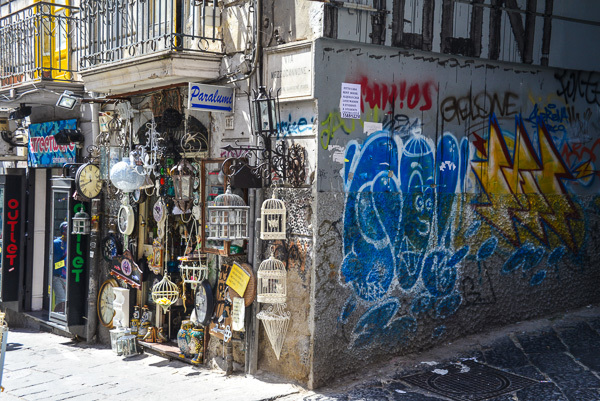 A last glance behind and then the clickedy-clak of our cases once more follows us past the taxis and the tourist hawkers and along the cobble stones of Naples. We are in Italy! Luckily the hotel has a lift and our modern, newly refurbished room feels enormous after the stateroom on the ship. It’s a good start. 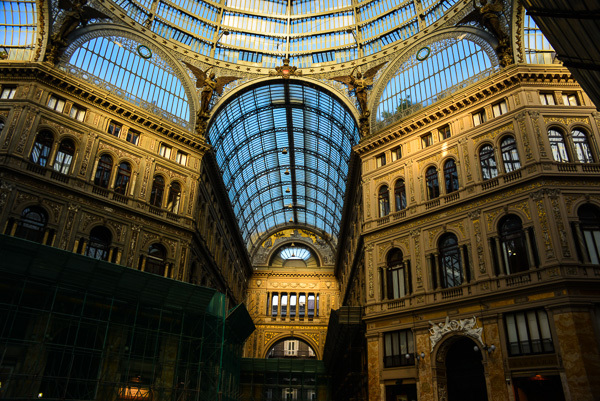 We walk off to explore Naples, a city we know nothing about. Actually, not quite nothing. 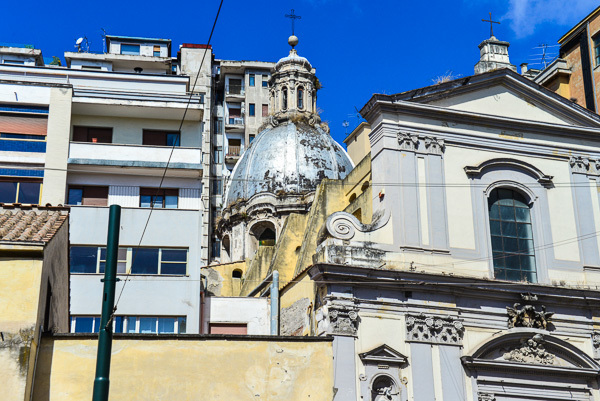 A recent re-viewing of the movie “Eat Pray Love” has given us high expectations of the excellence of pizzas in Naples, but that particular exploration will have to wait. 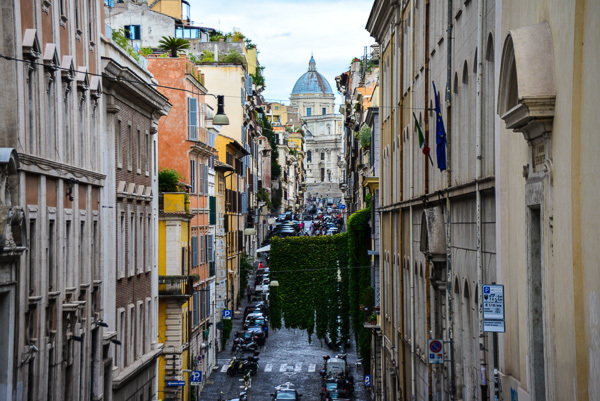 We have been pointed to the Via Tolado, which turns out to be an almost vehicle free, cobbled road running from the centre of the city to the vast Piazza Plebiscito and on to the Bay of Naples. 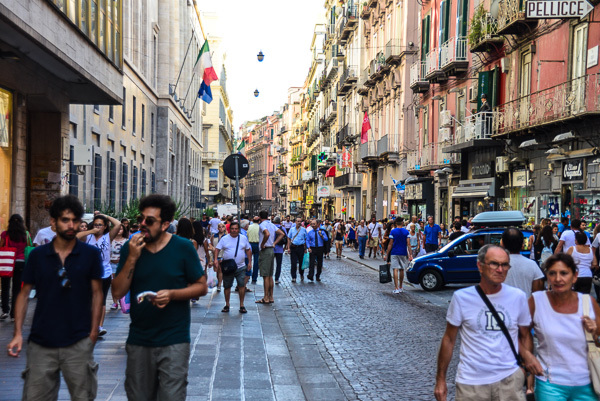 It is crowded, not with tourists, but with locals who are enjoying the late afternoon coolness, catching up with friends and family and a bit of shopping. Either side of the Via Toledo narrow streets run off into the distance. Down by the water Mt Vesuvius sits quietly on the other side of the bay. It looks so benign for the volcano that overran Pompeii. Buildings rise up the slopes on all sides. When will the next eruption be? Mt Vesuvius. The outskirts of Naples run right to it’s foot. It’s now evening and time to find our long anticipated pizza. 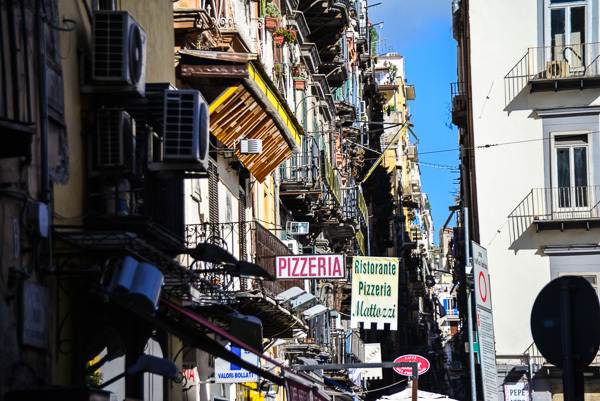 We peruse the line of cafes along the waterfront and pick Penelope’s for no particular reason, blithely assuming that all the pizzas in Naples would be good. 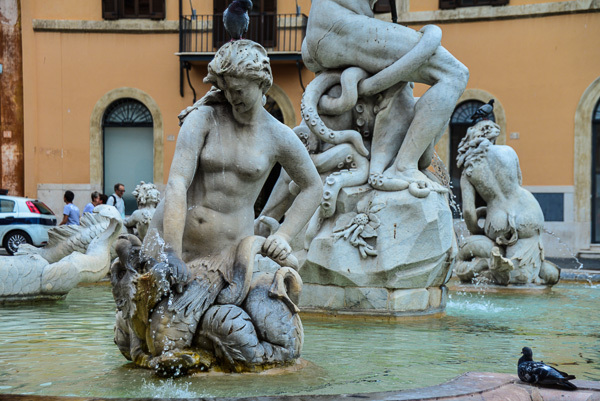 I mean … we’re in Italy! Unfortunately, the reality didn’t anywhere near match our imagined feast. The bases were thick and stodgy. The margarita had tomatoes from a tin and thick slabs of unmelted mozzarella cheese. The seafood was more or less the same with the additions of a thick covering of shellfish … still in their shells! Oh how illusions can be shattered and expectations dashed. Dominoes, eat your heart out! The setting was beautiful, though, as the sun went down and we strolled back to the hotel along the crowded evening streets. Every city block seems to have it’s ornate church. 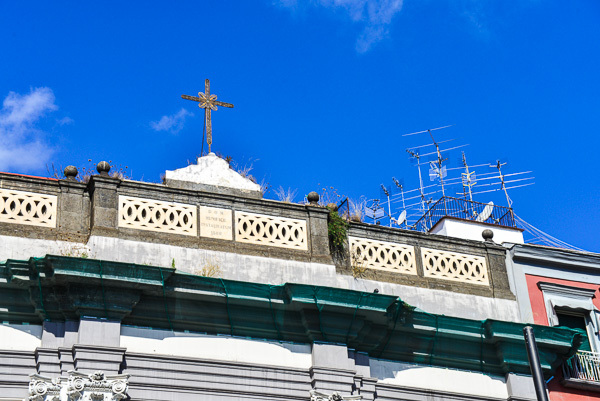 Ancient and modern crosses stand side by side on the rooftops. There’s only one place to hang the washing! After an excellent continental breakfast at the hotel with drinkable coffee and warm sweet pastries we once again set off to explore the city. Turning up the Via Tolado and then right off the Piazza Dante we are soon lost in the narrow streets of the old part of the city. 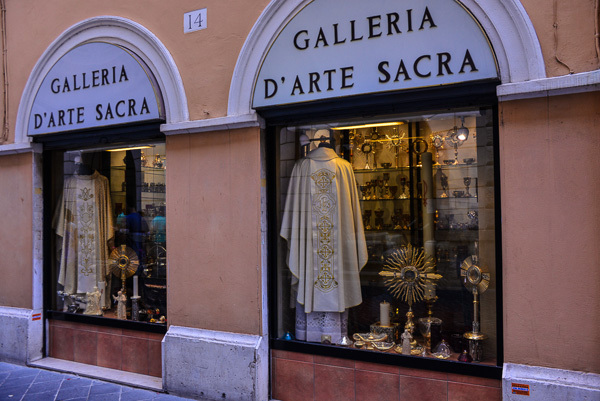 Churches and other religious buildings are everywhere, with the narrow streets outside filled with small shops and market stalls. Everywhere the graffiti covers the first two metres of the walls. We loose track of where we are and which buildings are which as we wander as the urge takes us. 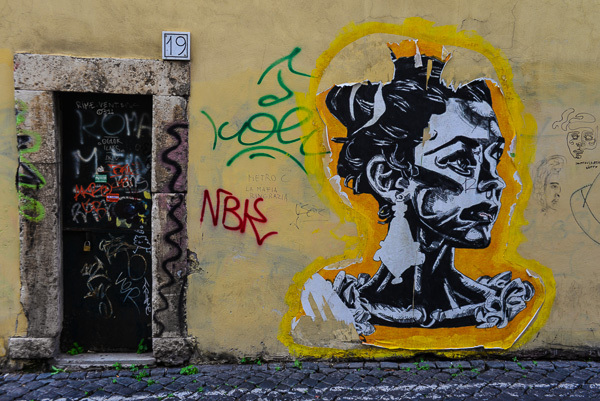 Graffiti covers the first two metres of every unprotected wall in Naples. Not yet street art as in Melbourne. More urban decay. 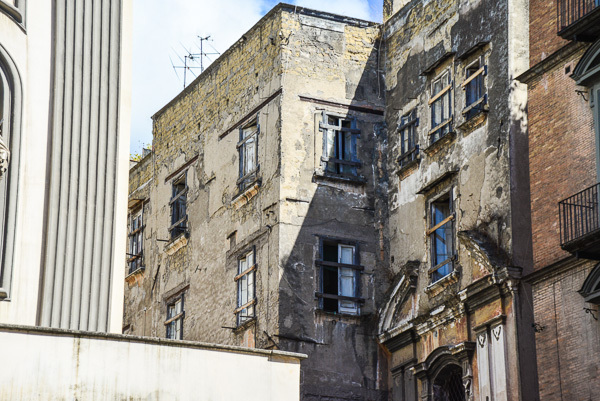 Who will renovate these buildings? We stop in a small cafe and everybody gets involved when we ask someone to take a photo of us. The Italians are lively people seemingly always ready to join in. It is great fun watching them talking to each other with continual waving of arms and gesturing to make a point. 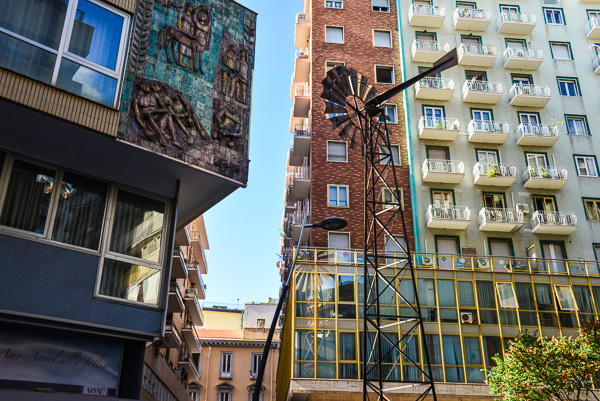 Sometime later we emerge into the more modern part of the city and find our way back to the hotel. 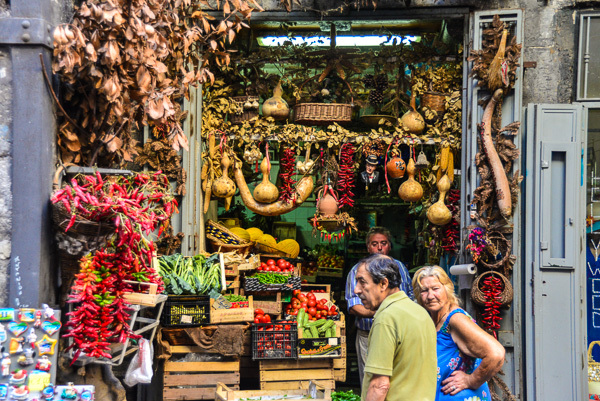 Deep in the narrow streets of the old city this amazing veggie shop. Opposite the veggie shop a reminder of what’s to come. 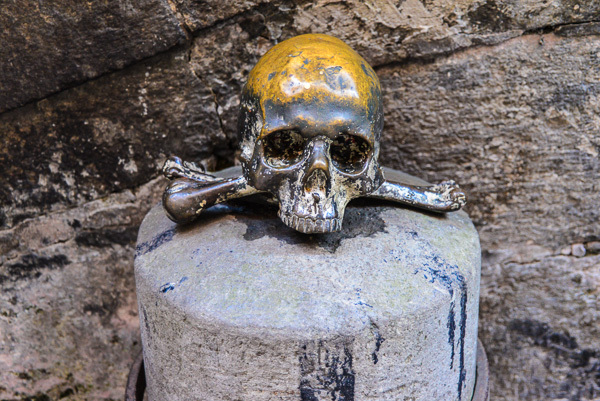 The skull shines from the touch of passing hands. Not really sure what these are. Anybody know? 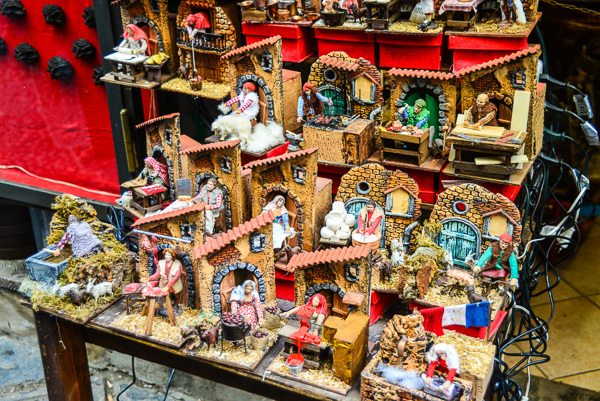 In every one of these miniature models the figures moved back and forth. 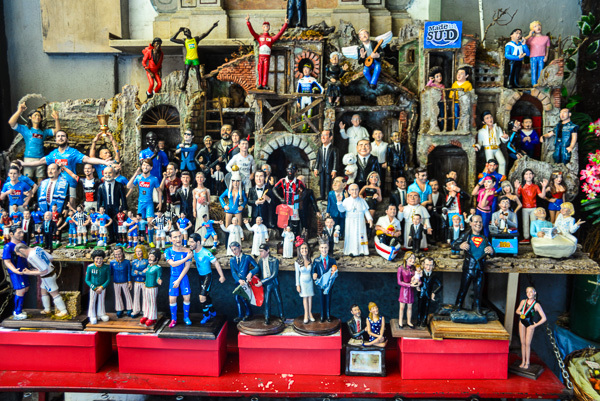 A miniature Andrew and Kate figure front and centre with baby George. What’s all this about? 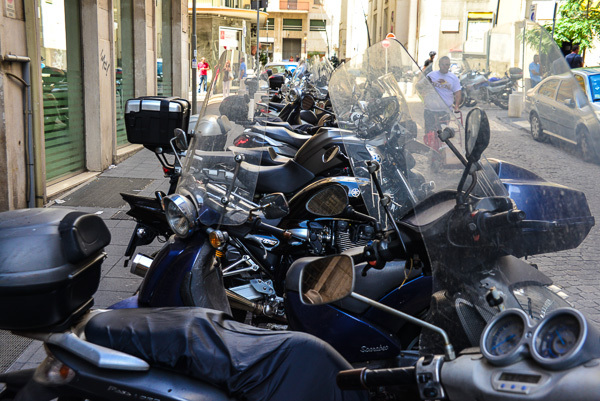 Life in Italy without scooters – unthinkable! The Via Toledo – the main street in town. 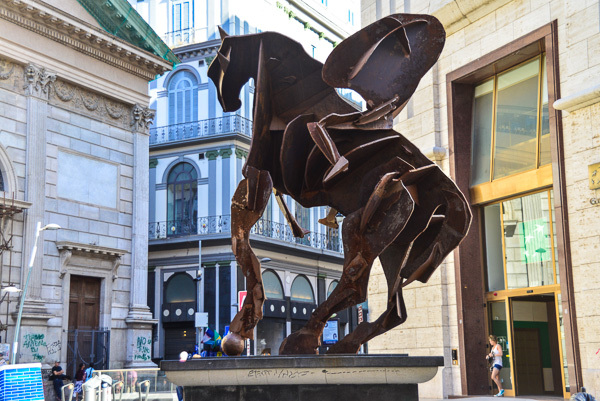 Via Toledo – a great place to sit and watch the world go by. 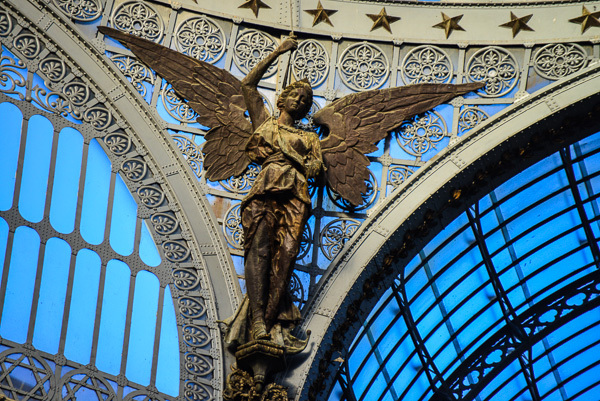 … complete with it’s own angels. 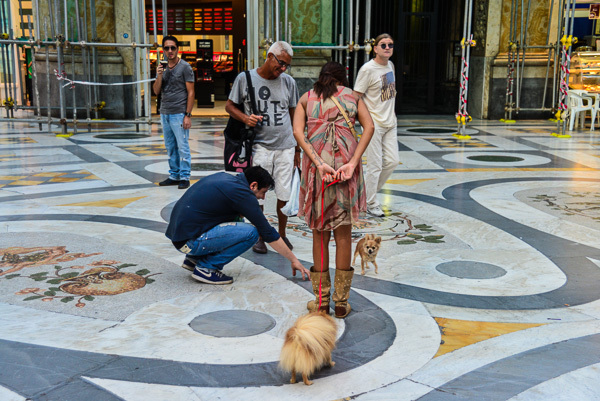 Dogs are often the centre of attention. 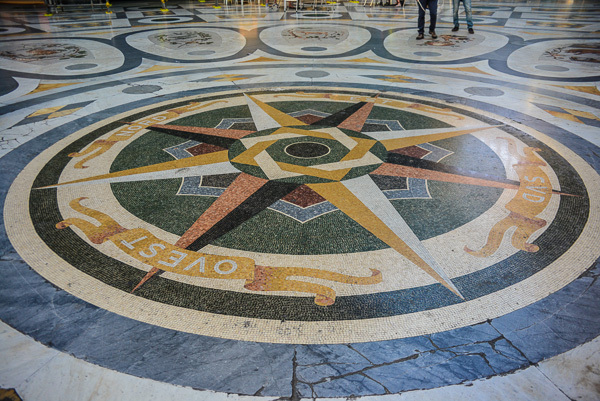 This marbled floor is a huge astrological calendar. Tuesday. It’s the new moon today so anything could happen. 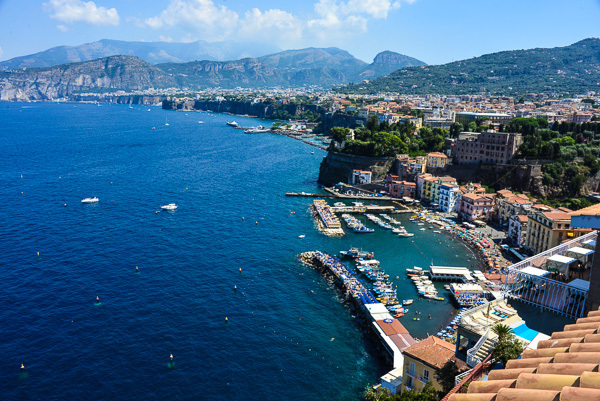 We pull our cases back through the cobbled streets to the ferry terminal to catch our ferry across the bay of Naples to Sorrento, the so called gateway to the Amalfi Coast. I have pre paid on the internet but still have to change my piece of paper for real tickets and am glad that the very long queue was for the Capri ferry not ours. Ticket in hand we sit and wait for the ferry next to the huge cruise ship moored nearby. When the eleven o’clock ferry arrives we are almost first in the queue and so the first to hear that this ferry has been cancelled. We are somewhat taken aback to say the least. Technical problems they say – catch the one o’clock instead! 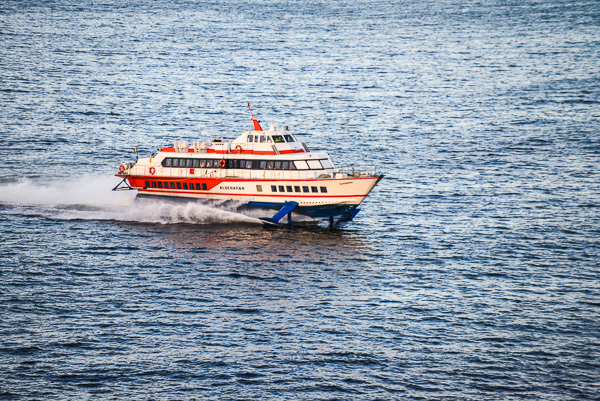 I was hoping the ferry to Sorrento would be one of these. Alas it was not to be. We are now cruising our way across the Bay of Naples to Sorrento. As we approach the town we see it is built at the top of cliffs with hills rising up on all sides. Pulling our cases along the dock we debate whether to take a taxi. 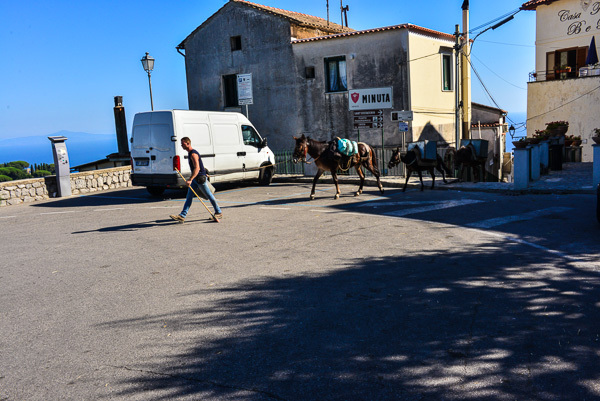 There is a rental car to collect from the “downtown Sorrento” office and assume that this will be in downtown (logical one would think), and so not too far away. There is a sign directing us to a lift to the top of the cliffs. This sounds like a good idea so off we set. The path gets narrower and narrower as we follow it under the cliff face in what has turned into a long walk. Eventually we are moving upwards in the lift and emerge into the sunshine of the square outside the Convento di San Francesco (St Francis Church and Convert). It looks like the car office is about a kilometre or so away, so finding a nice wall in the shade for Jacqui to sit on, surrounded by our luggage, I walk off into the streets of Sorrento to get the car. So goes the plan anyway. 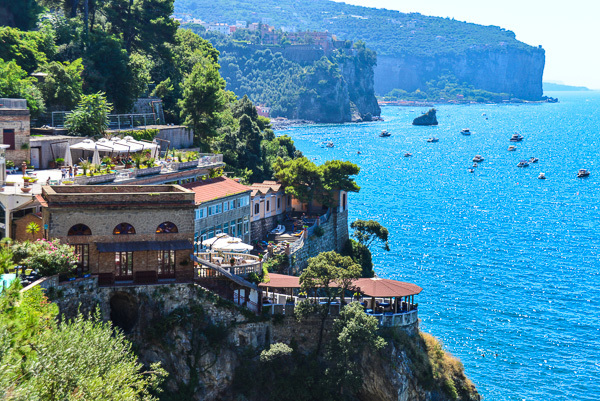 Sorrento from the cliff tops. Note the artificially created beaches down below. Hope lies in the ascensore but our ascension was a long way off! It turns out that the rental office is a kilometre further down the road that my phone map indicated, so here I am at the office at three o’clock and I am hot and tired. The “office” is a single large doorway fronting the street in a tall blank block and it is very firmly shut. Reading the sign next to the door tells me that the office is closed for lunch and will be open again at three thirty. 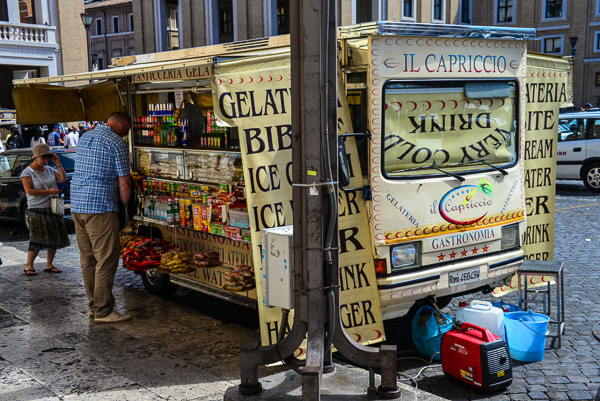 Of course … the famous Italian lunch hour that the Brits hate so much! Mmmmmm. This leaves me with a dilemma. I have already been away longer than expected and have no phone to contact Jacqui. Should I walk back or sit and wait? I stay. 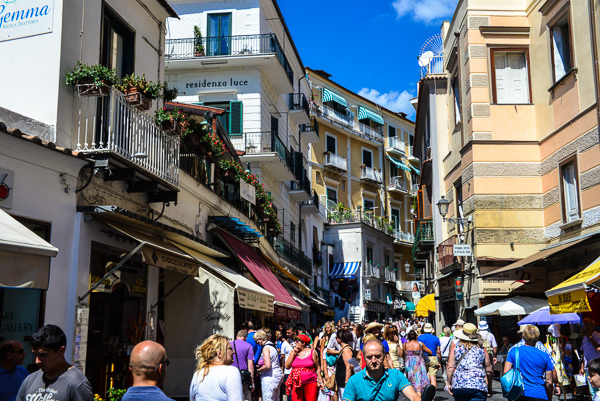 After considerable thumb twiddling, by four o’clock I have the car and drive back though the narrow streets of Sorrento, around the narrow one way system and back to the square. Did I mention the roads were narrow? Here I find Jacqui sitting on the wall with her ring of cases like a stockade to keep out the large crowd of people surrounding an enthusiastic tour guide describing the St Francis statue beside her. All’s well that ends well (at least so I think). The view over Sorrento from our breakfast table. The country is spectacular and soon we are twisting our second gear way up the mountain side to our B&B, the Ville Vieille, booked on the internet some time before. Mavis (our trusty gps carried all this way for just this purpose) can’t find Via Meta Amalfi 80 but gives us 81, so 80 must be just across the street, right? Wrong. Eventually, after asking in a local dress shop in the middle of nowhere, we have found it and it isn’t anywhere near 81. I suppose it is like property lot numbers in Australia which often have no logical relationship to each other whatsoever. The entrance to 80 is across the busy road and after squeezing through an incredibly narrow right angled entrance we are faced with high iron gates and a very steep driveway down the side of a cliff. We are however in the right place. Our day so far has been interesting to say the least, but as we settle in to our room we can put all that behind us … maybe. Time to eat. We are not yet used to having to forage for food. Walking up the narrow winding road we get to the settlement where we spotted a small restaurant earlier. It’s shut. We ask someone and they tell us eight o’clock. It’s six thirty. Mmmmm. Back down to the B&B with Sorrento spread out before us in the evening light. Spectacular country. After extricating ourselves from that very difficult entrance, we drive into town. Anticipating difficulty with parking we decide to find a spot and walk. I dutifully fill the parking meter and off we set. It soon becomes obvious that there are no restaurants at all in this area. Back to the car and further into town to find another spot, this time in a car park. Walk down the hill and we emerge into the main square of Sorrento and flop gratefully into a restaurant. What a day! Did I mention that it’s the new moon? 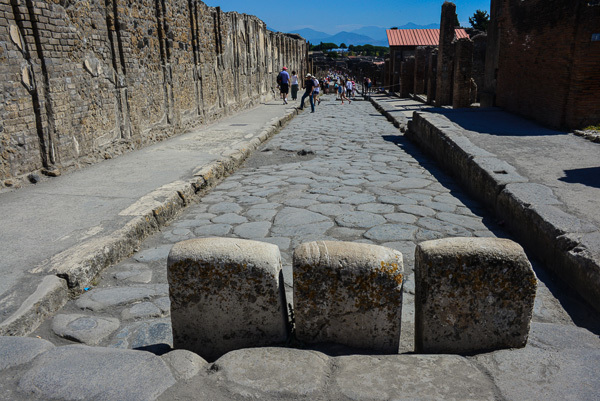 Warn by the centuries, huge flagstones mark the entrance to Pompeii. Wednesday. 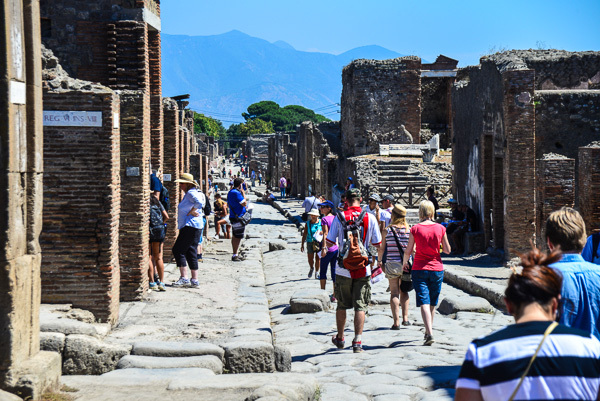 Today we will make the hour drive to Pompeii. 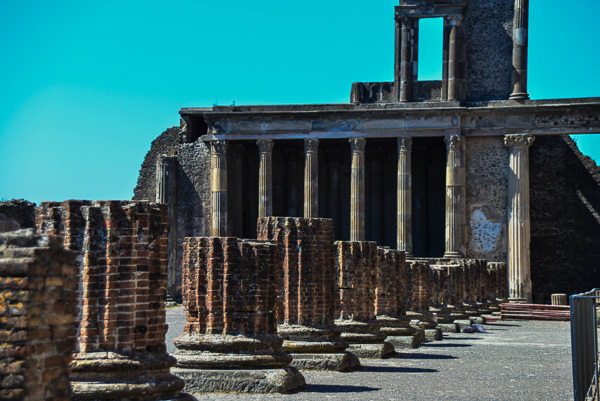 The drive is uneventful (after yesterday uneventful is good) and we are soon walking into the entrance to the Ruins of Pompeii with the volcano that was it’s downfall rising behind. 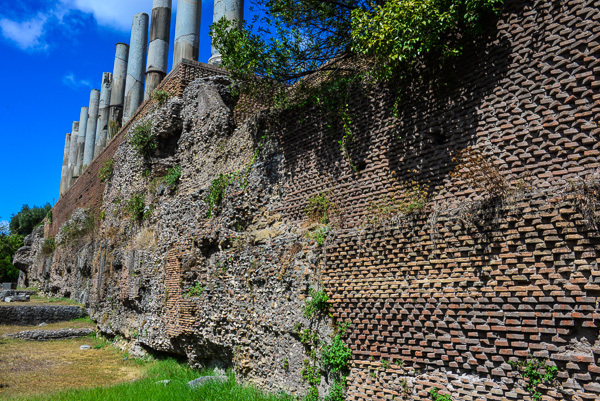 In 79AD Vesuvius erupted and covered the city with four to six metres of pumice and ash. It disappeared from sight until rediscovered 1,500 years later, and it wasn’t until the seventeen hundreds that serious excavations began. Those excavations have continued to the present day and there are still tens of hectares still to be uncovered. It has been a tourist spot for over 250 years. 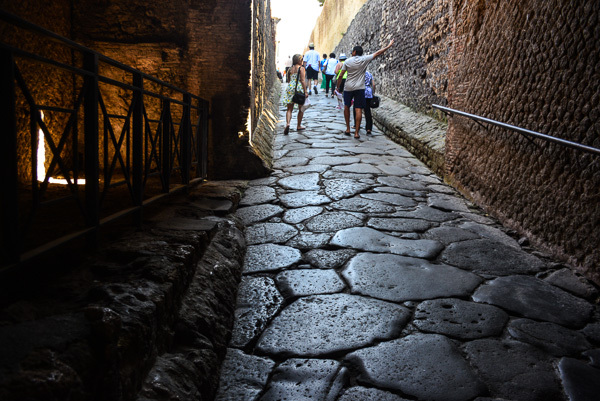 It’s all very Roman! I was interested to see columns built of brick. In fact, brick was used extensively. Two things surprise about the city. The first is just how big it is. Much bigger that I had imagined. It was city of more than 20,000 in it’s heyday and so covers an enormous area. The second are the figures preserved in the ash. I didn’t realise that the remains of bodies covered by the ash had long since disappeared (they would, wouldn’t they when you think about it) but because of the density of the ash the bodies left a cavity where they had been. 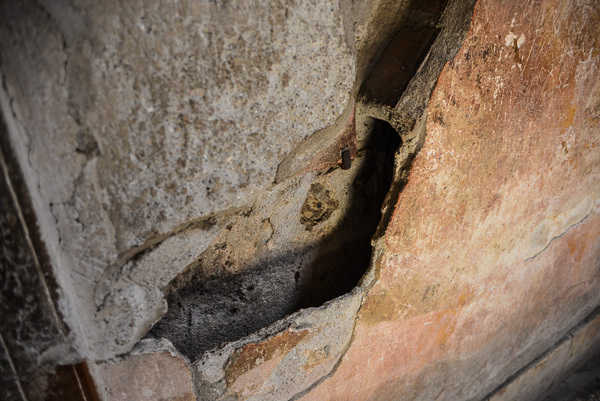 This cavity was then filled with plaster by the excavators to produce the outlines of the people who died. Some of these forms are quite touching. 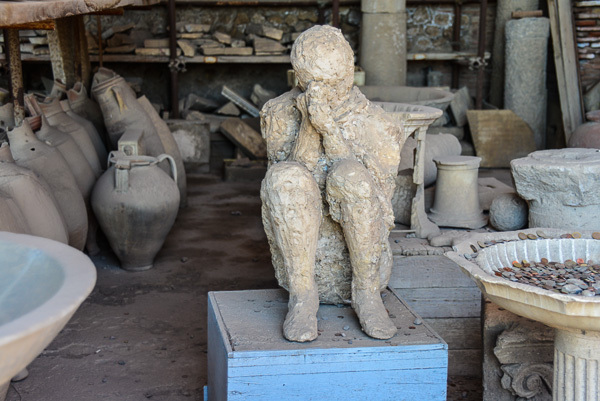 As for the rest of Pompeii, I’ll let the pictures speak for themselves. This road stretches into the distance. 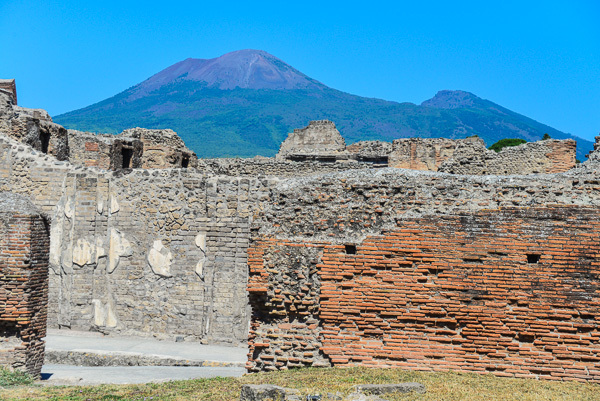 Vesuvius sits quietly in the background. Again, note the extensive use of brick. You can really feel the anguish of this figure. Inside this building we find very fine mosaic work. There are still some rooms more or less intact. I was surprised to see double skinned walls. It has been a very popular spot for the tourists for the last 250 years or more. 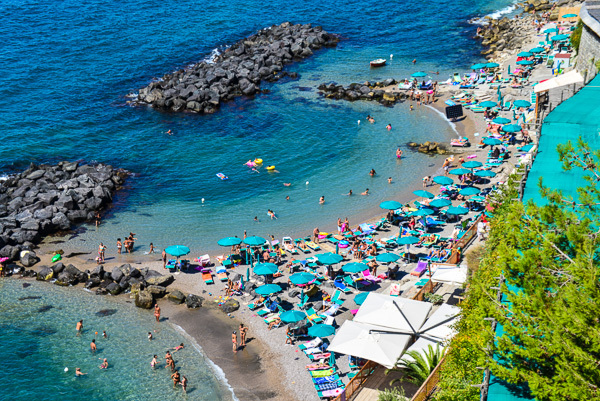 Thursday – it’s time to move on to our next stop which is to be in Scala high above the town of Amalfi and at the centre of the Amalfi coast which we have come to see. The drive along the road which clings to the costal cliffs is spectacular. The roads are narrow and busy in this, the height of the tourist season. 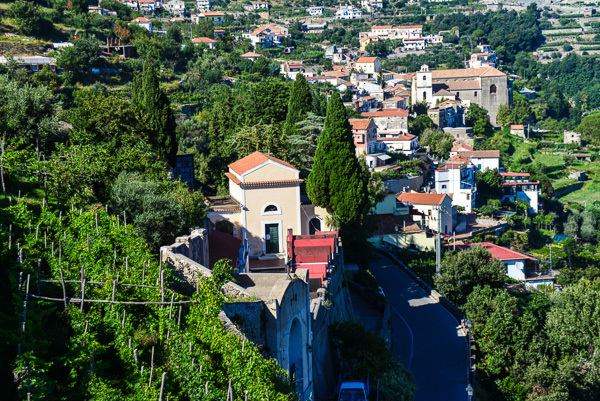 For the whole of the time on the Amalfi coast I rarely get the car out of second gear and actually spend some of the time in first gear to navigate the steep winding roads. Many of the cars here exhibit the scars of encounters with cars going the other way or the walls and cliffs which line the road. Even our hire car has a scrape down the side and a damaged wing mirror. Parking is also incredibly difficult and approaching the town of Positano cars are parked tightly along the side of the road for several kilometres on either side. We take any opportunity to stop and look at the ever changing coastline. The beaches below are artificial, small and very crowded, although the water is an amazing colour! 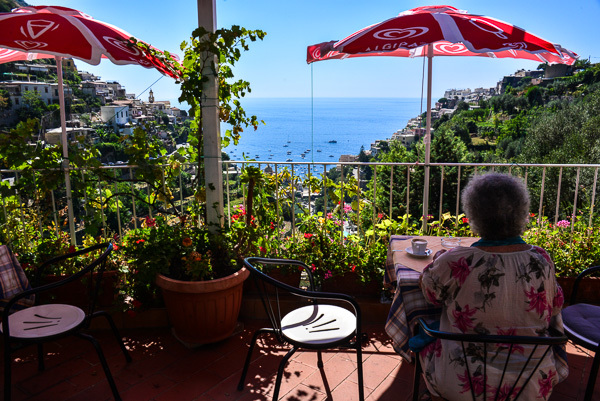 The town of Positano flows down the hillsides viewed from our coffee stop. An even smaller beach and part of the tortuous coastal road. This road is an amazing feat of engineering. Mules are still used for the many parts that cars cannot reach. Here next to the Casa Falconi B&B. 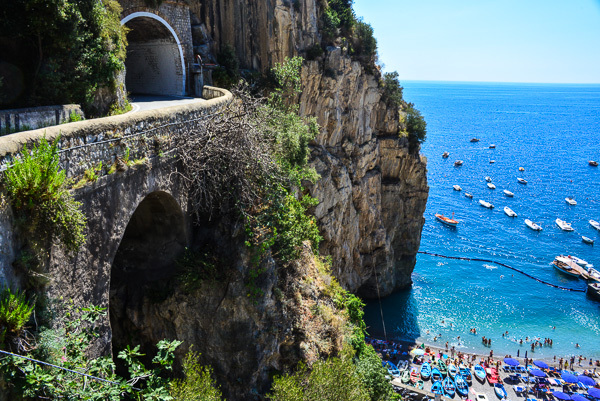 Through the town of Amalfi, Mavis (the gps) tells us to turn left and start climbing up to Scala, a tortuous thirty minute drive up the coastal cliffs. The sheer steepness of the hills has an interesting result for Mavis. 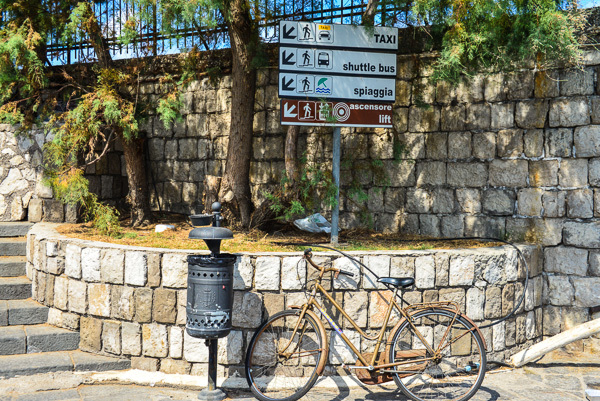 In reality, many of the streets found on the map, are in fact stairways between the loops of the switchback roads or paths. 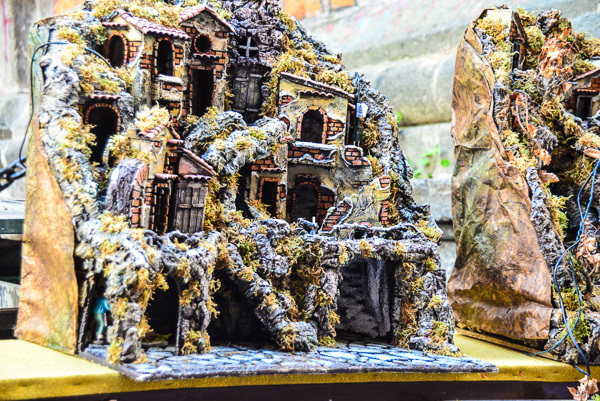 Mavis thinks they are real roads, and so finding the Casa Falconi B&B proves quite difficult until we work out what’s happening. 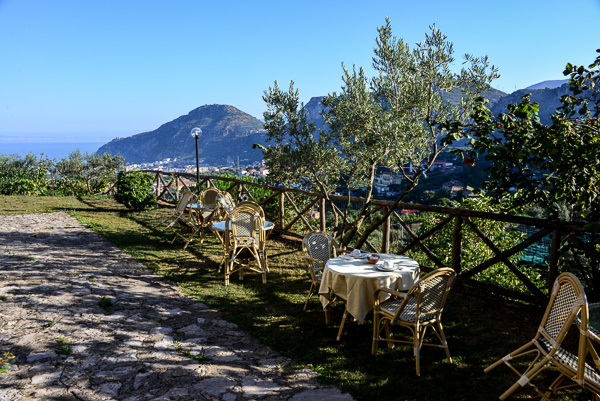 Now we are on the terrace of the B&B seemingly suspended on the side of the hill with a spectacular view of Ravelo across the valley, Amalfi far below with the oh so blue Mediterranean stretching to the horizon. Our car is safely locked into it’s wire cage … private parking is very rare in these parts and carefully guarded. 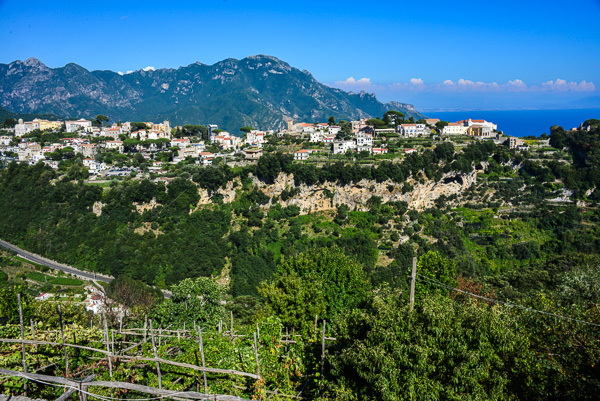 The small town of Scala, perched on the hillside above Amalfi. Scala is not a tourist destination. I reminds us somewhat of the hill towns in India and Nepal with everything terraced on the steep slopes. 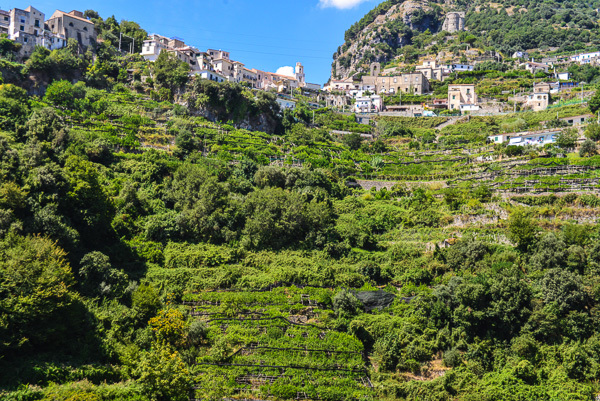 Those too steep or narrow to build on are filled with growing things … grapes, fruit trees and vegetables. The small communities usually surround a large church and the sound of bells is frequent. We take the half hour walk to a local restaurant and eat excellent local food surrounded by large tables full of animated diners. We are definitely in Italy! One surprise on the menu … pizzas come as normal or 1/2Mt. When we ask what 1/2Mt means we are told it means half a metre of pizza to share … we then see them arriving on trollies for the next table! Amazing! 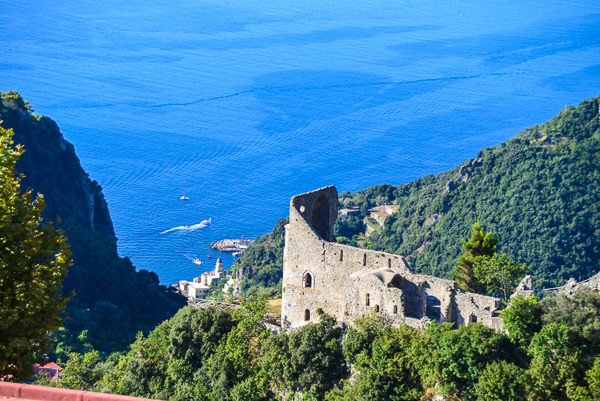 The town of Amalfi far below the ruins of an ancient cathedral. 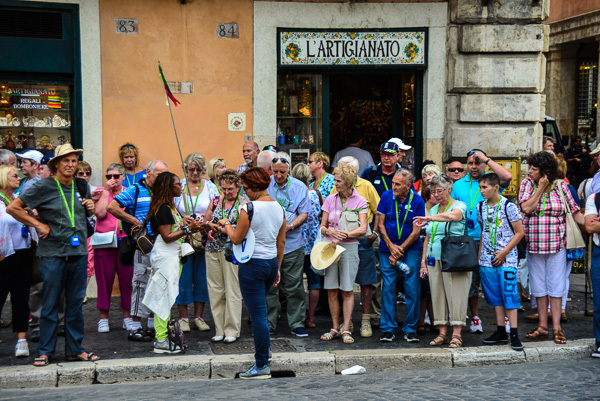 We take the local bus for the thirty minute journey down to Almafi for the day and join the tourist hoards. Sitting in the main square enjoying our very italian cake and coffee, we once again watch the world go by. 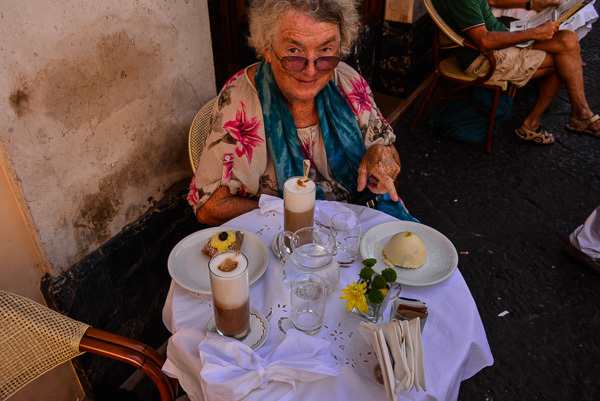 Coffee and cake Amalfi style! The coffee was generally very poor. These were $15 each and not even good! 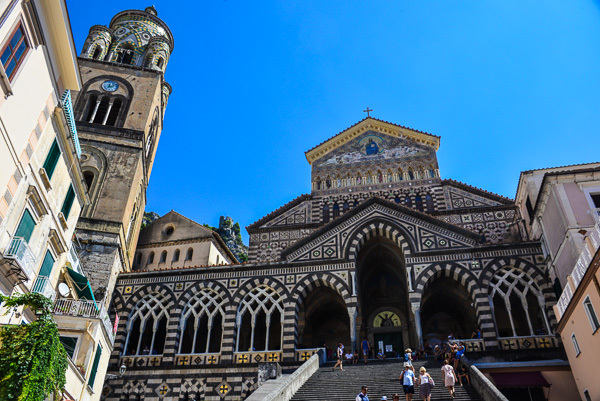 The very ornate church in Amalfi. Inside the crypt of the church in Amalfi. They definitely like their churches to be decorated. 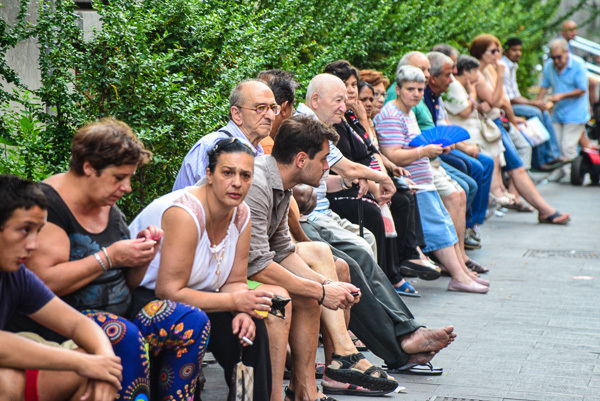 The tourist hordes – it’s the height of the season when Europe is on holiday. Growing things on all the narrow terraces. After a last night in Sorrento in a cliff top hotel and having returned the car we are off back on the ferry to Naples and then the two hour train journey to Rome, our last stop on this epic journey of ours. 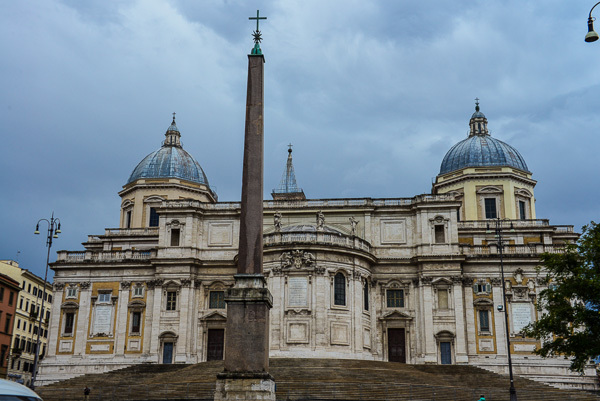 So it is that on the last day of August after travelling all day, we arrive in Rome and the hotel Doria right next to the Basilica di Santa Maria Maggiore and just around the corner from Roma Termini, the central railway station. 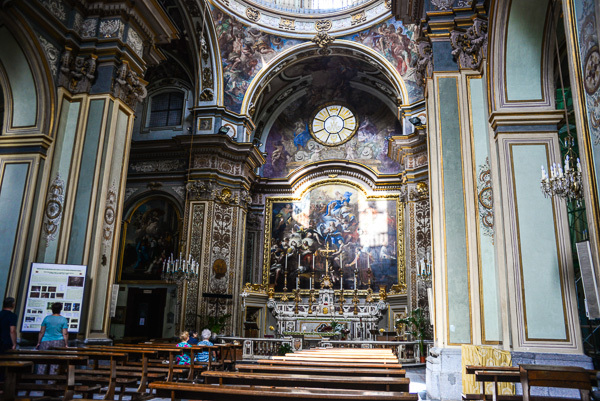 The Basilica di Santa Maria Maggiore just outside the hotel. We are greeted by a charming silver haired, older man, impeccably dressed with a broad smile (a real Roman Jacqui later commented). He welcomes us warmly and immediately makes us feel at home. The lift was intimate to say the least and could take one person and a case, or two people. At least over the next two days we got some extra enforced hugs whilst travelling to the third floor! Dinner is at a street cafe between the high rise buildings; the street is cobbled and the only passing traffic is the occasional rattling tram. We are serenaded by an accordion playing singer who passes the hat after a few songs. And so we are in Rome. Our much anticipated breakfast on the rooftop terrace is dashed by our first rain for weeks. 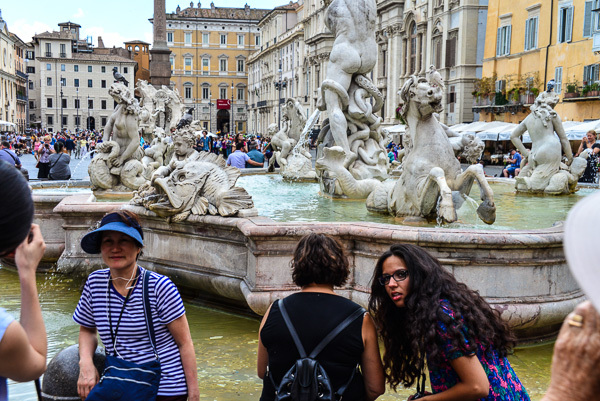 Luckily, by the time we go out it has at least eased to showers and after buying a cheap umbrella from one of the many hawker outside the station we set off to explore Rome. Detail inside the San Pietro in Vincoli Basilica, home of Michelangelo’s Moses. We all get to meet the grim reaper sooner or later! 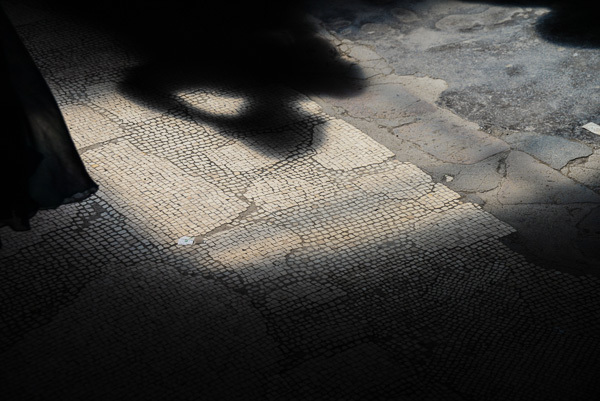 Rome is old. 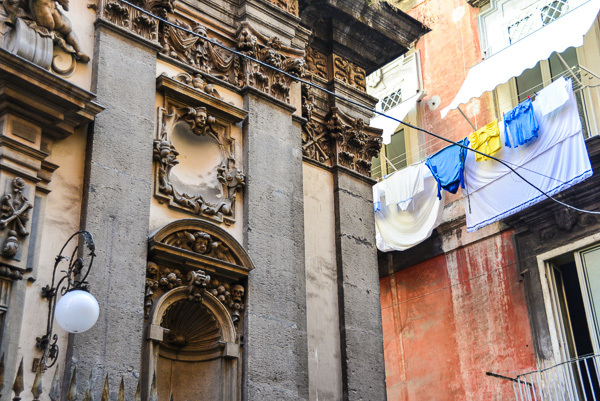 There seems to be a grand building of one sort or another on every corner with the standard Italian eight story blocks with their lines of balconies in between. 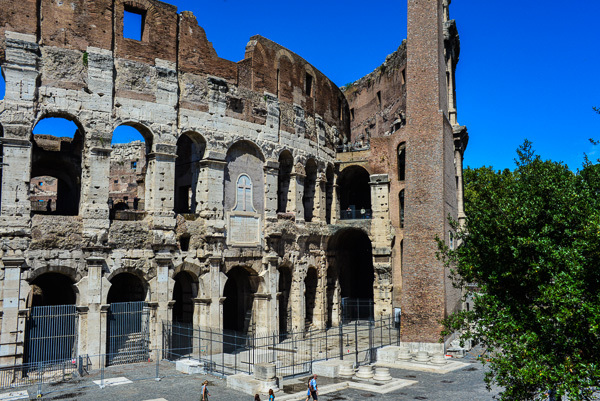 Today we are going to the Anfiteatro Flavio Colosseo, known to us as the Colosseum. 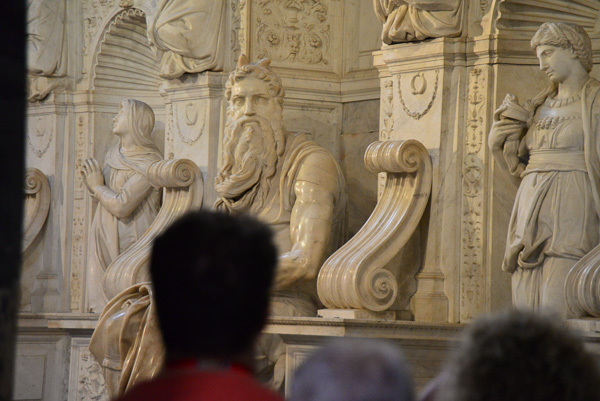 We walk the streets, popping into the odd church on the way (which although we didn’t realise it, it was the San Pietro in Vincoli Basilica, home of Michelangelo’s Moses. We are obviously not reverent enough!). 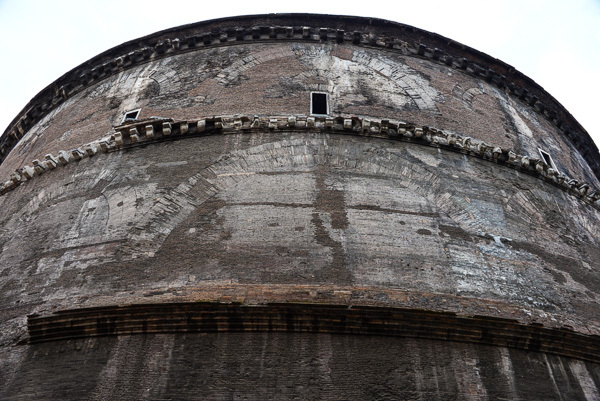 After an hour or so we arrive at high outer walls of the Colosseum. It is amazing and for the next hour we wander around with the milling crowds of tourists admiring what remains of this incredible building which has stood for so many centuries. 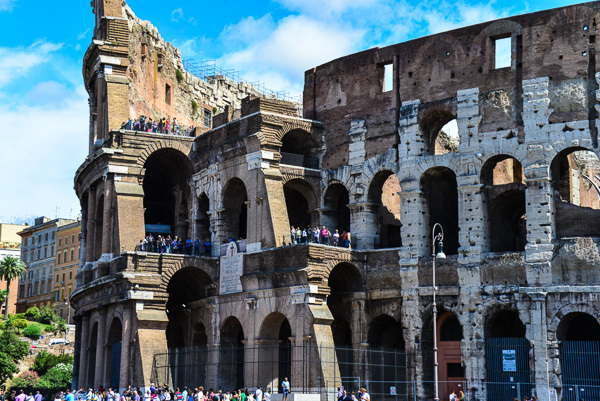 The colossal Colloseum – just as impressive in real life. Will you just look at that brickwork! The nearest we got to street art of any kind. It’s Tuesday the 2nd September and our last day in Rome, indeed the last day of this European journey. It is reserved for the Vatican. 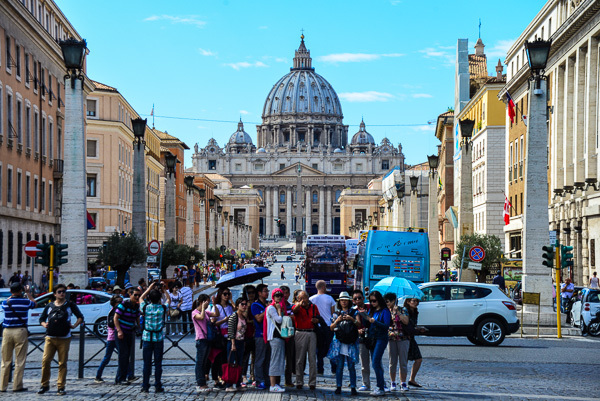 We catch the very crowded number forty express bus from Termini to the Piazza San Pietro, St Peter’s Square. 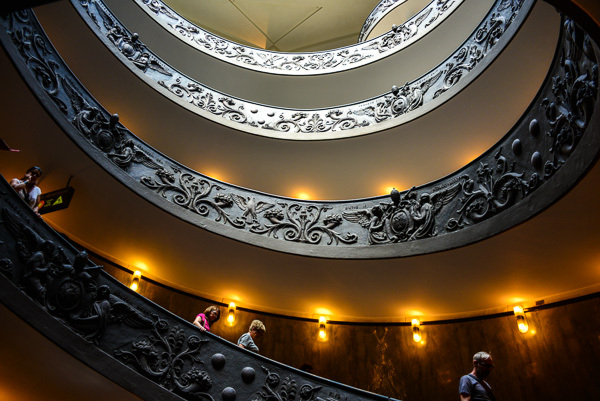 The classic approach to St Peter’s and the Vatican. 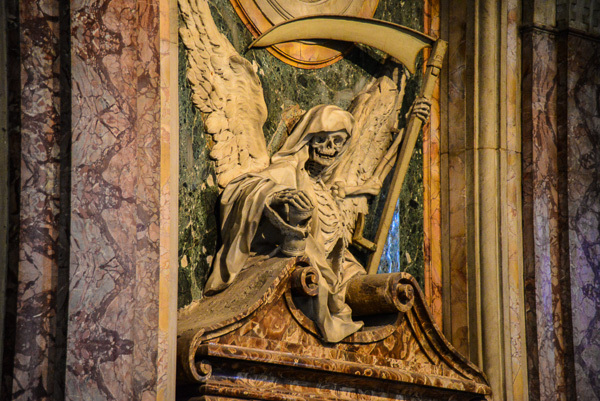 We had booked some tickets for the Vatican Museum on the internet, having been warned about the long queues. 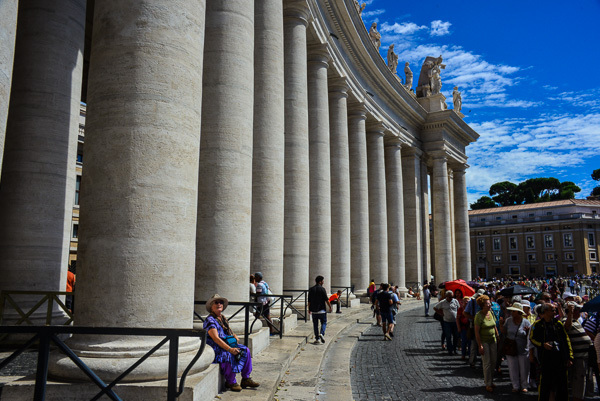 There is a long queue for the free entry to the Basilica di San Pietro, winding it’s way along the side of the square. Having walked for fifteen minutes around the high walls of the Vatican we find that the entrance to the museum is queue free and so the extra eight euros ($12) we paid for the online booking was unnecessary. Win some, lose some I guess. 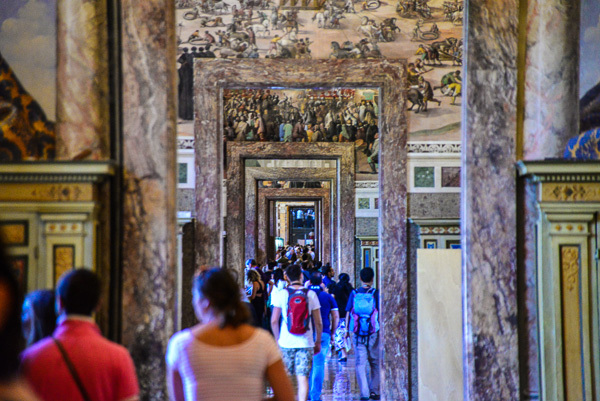 The Vatican Museum has two one way paths through it, the long path or the short path both of which go though the Sistine Chapel at the half way point. We choose the short route. 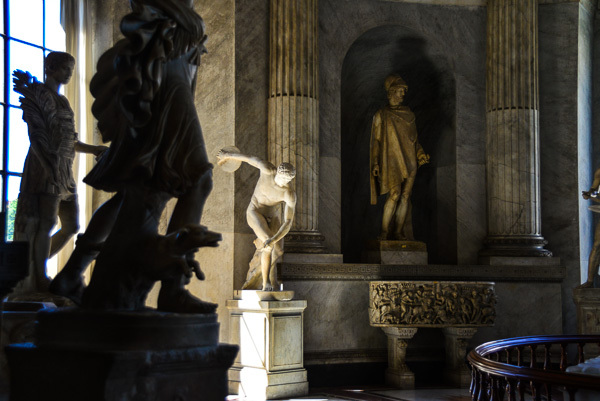 It is very crowded as we walk across marble floors through chamber after chamber of artworks; paintings, prints, sculptures, jewellery and tapestries come in waves under the ornately decorated arches overhead. 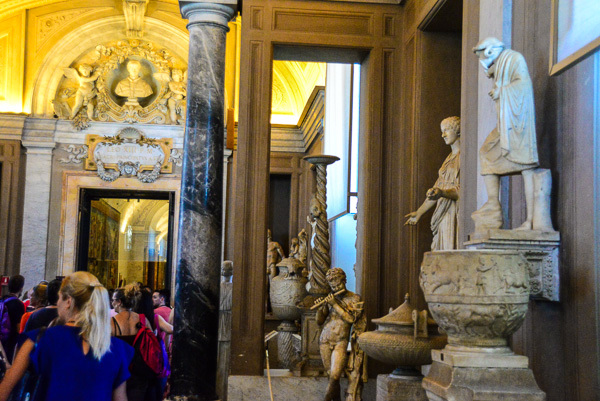 Inside the Vatican Museum the artworks seem endless. Pan pipes the visitors through. 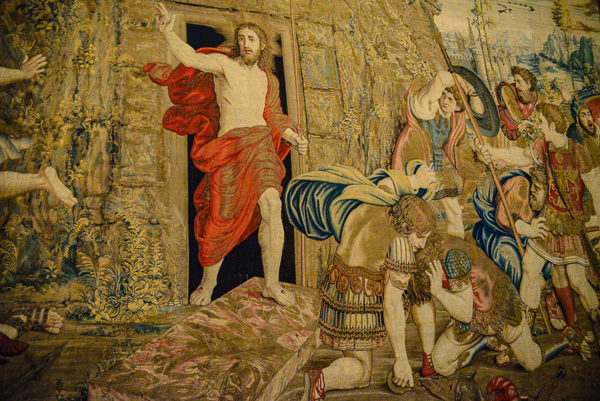 Here’s the star of the show coming back to life in this ornate tapestry. 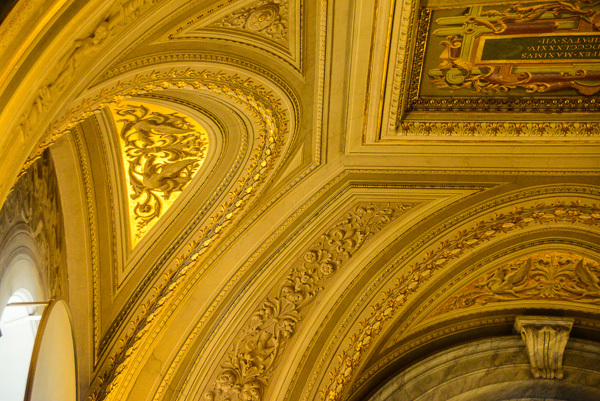 Did I mention that the ceilings are ornate? Gallery after gallery after gallery unfold before us. 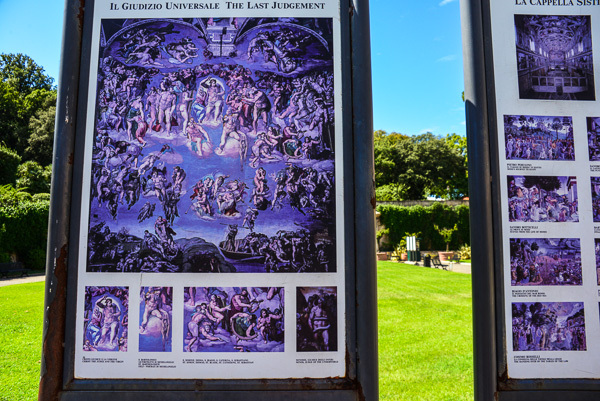 The Sistine Chapel was off limits for photographs but this poster outside told the story. 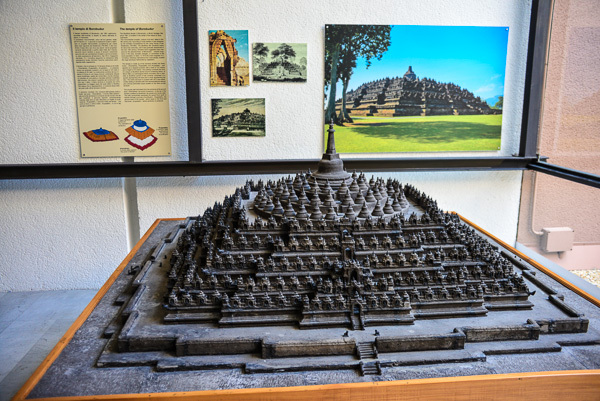 Interesting to see this model of the indonesian Buddhist shrine of Borobudur in the very heart of the Catholic church. Jacqui contemplates the long queue for St Peters Basilica. 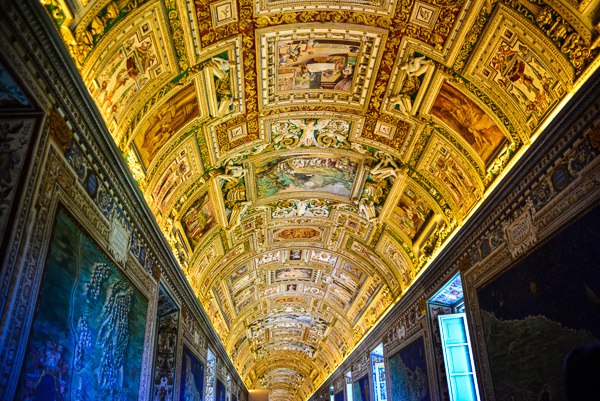 The Sistine Chapel is huge and packed full of people. A man shouts to exhort visitors to be silent in this place of worship, all to no avail. 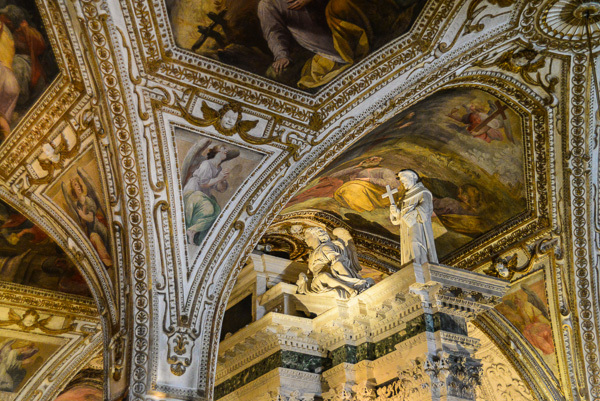 How Michelangelo ever managed to decorate this chapel is, in itself, amazing. Standing on scaffolding high up in the ceiling looking upwards for four years with a candle for light – almost unbelievable. 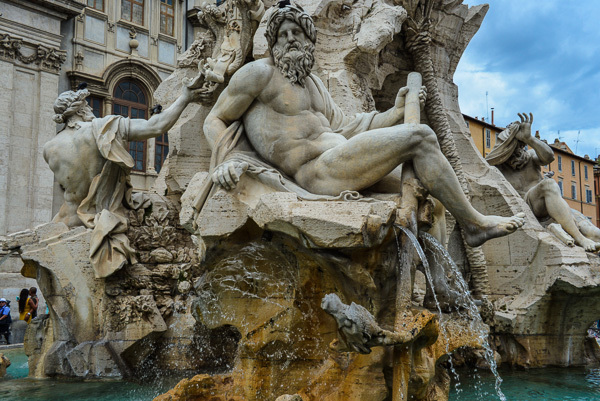 We begin our walk back, crossing the river by the Castel Saint’Angelo and then to the 15th Century Piazza Navona where we sit and eat an ice cream by the Fountain of Neptune. Neptunes’ sea is full of monsters which, of course, must be fought while naked. Follow the flag! 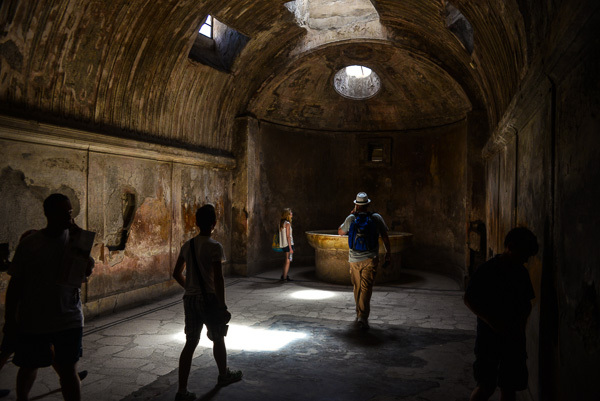 … a tour group in action, or rather inaction. 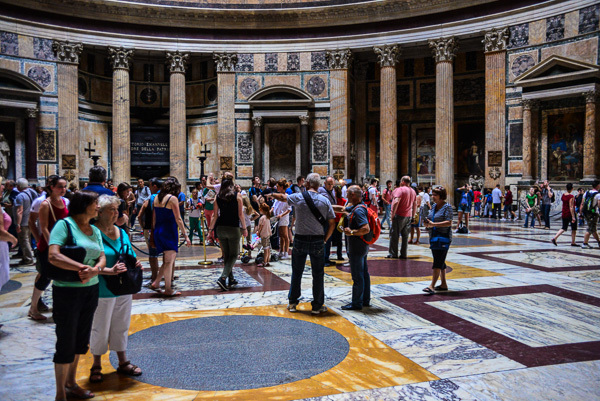 Then through the back street to the huge bulk of the Pantheon, built in the first two centuries of the Christian era, where we join more crowds of people. Inside the huge dome the man calling for silence in several languages uses a microphone this time. Again to no avail. 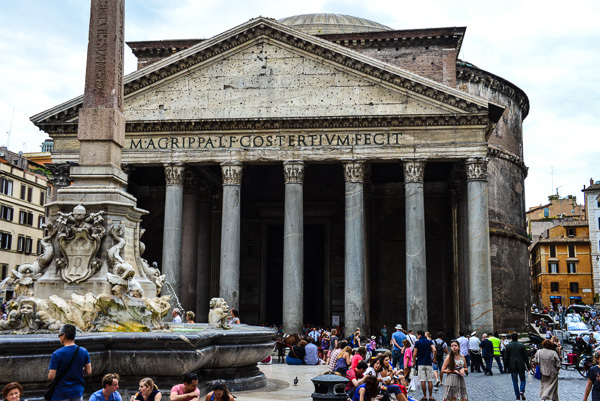 The huge bulk of the Pantheon. 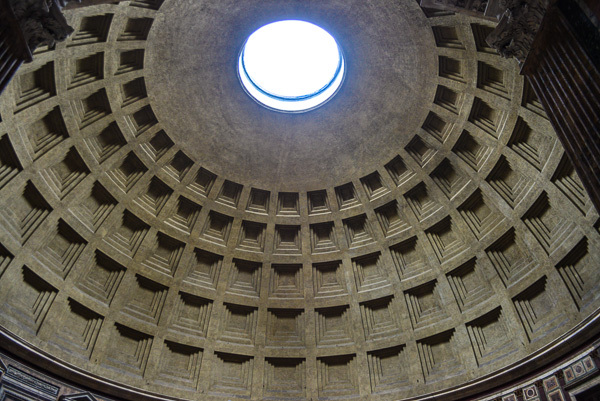 The dome of the Pantheon really is impressive. Oh so many people walk these marbled floors. 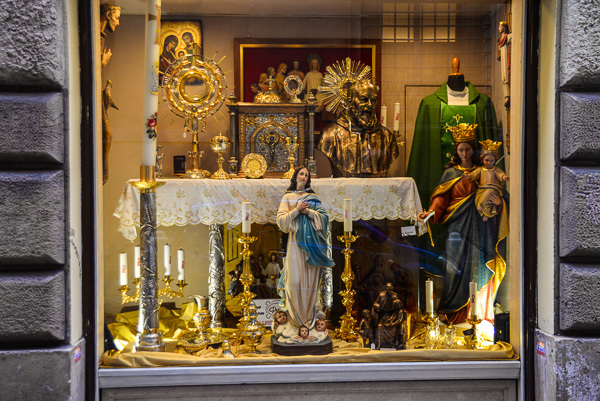 Lots of shops full of religious paraphernalia. Symbols, symbols and more symbols. Note the bodyless heads underfoot. On we go through the Piazza Venezia where the enormous monument to the first king of Italy, dominates the square. The Victor Emmanuel II Monument was built at the beginning of the twentieth century amid some controversy. 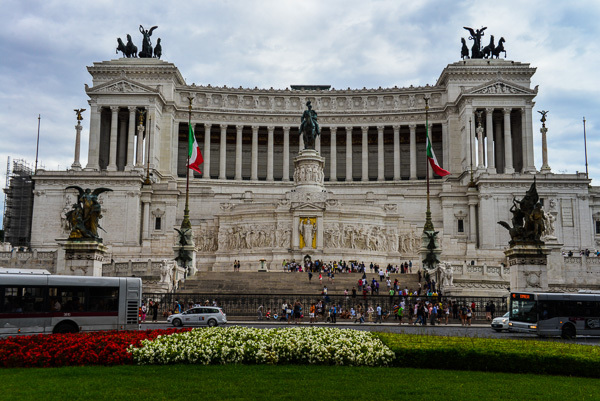 The Victor Emmanuel II Monument – this is a really big monument! 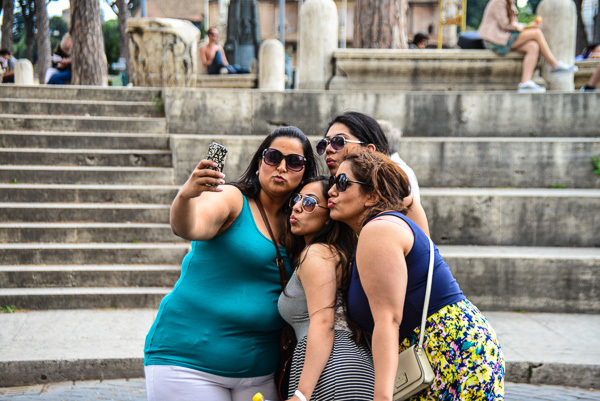 We all love a selfie … Italian women in their prime. Finally, footsore and tired we arrive back at the hotel after our last five hours of walking the streets of Rome. 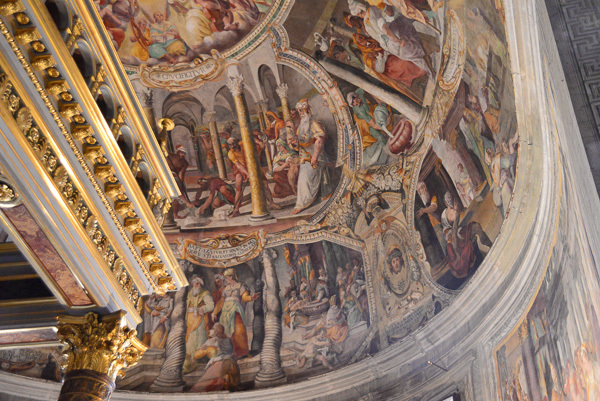 The dome of the Basilica di Santa Maria Maggiore tells us our hotel is nearby after our epic 5 hours walking around Rome. And now, a thirty six hour flight back to Brisbane is the last leg of our journey. We reflect on the people we have met and the places we have visited and are amazed at just how lucky we are. What a trip! We are now back in beautiful Noosa on the Sunshine Coast in Queensland. After our journey we realise just how lucky we are to have ended up in this part of the world. I would like to extend my love and thanks to all of you who have made comments and emailed me about this journal of mine. It makes the not inconsiderable amount of time that it has taken to get it all together really worthwhile. Thank you, thank you, thank you; may you all be very well and happy and may everything you wish for come to pass. I would especially like to thank Jacqui, my constant companion for this journey. We have travelled the highways and byways; walked hand in hand the narrow streets of town and city. Always across the table when we eat, she has been such good company as we have chatted and laughed our way around Europe. She has also been the editor of this missive and stopped me embarrassing myself with typos and punctuation in particular. Oh those apostrophes; I don’t understand their complicated rules, but magically, she does. Until we meet again on our next journey – enjoy! What a holiday you two have experience but I’m sure that, just like us, it’s so nice to get back home. You photo’s are something to behold, well done, and the english grammer, so many arguments these days on what’s right and what’s wrong, well corrected teacher!! And now it’s back to the mundane, although I’m sure that you’ll find something to occupy yourselves. This was such a lovely present to allow us to travel with you. Thank you. Although I am delighted to see you back in our little corner, I feel some bitter sweetness of longing for more of your adventures. I hope there will be more! They don’t need to be this far… and my favourite photo in this episode is that incredible vegie shop! What about an exhibition Allan? Dearest Jacqui and Alan, What a simply marvellous time you have had! Primmie and I have enjoyed your story and inparticular your photos immensley. It was so lovely to see you and have you to stay – you are always welcome. We were thrilled that you have enjoyed your visit so much and hope that you will treasure your memories. We inturn hope to make it out to Auss once more & you will definitely be on our agenda. Thank you both for putting the time into this blog. I’ve loved reading of the travels and travails. The photographs brought the journal to life so beautifully. And you next voyage will be to …..? Can’t wait to see. What a wonderful trip you had all over Europe. It was very Nice and interesting to read all your adventures. And now save back home in this world full of unrest. Perhaps we will meet somewhere in the future.